Let us reach new heights together! Be it in view of a climbing adventure or an automation project, there are two key areas for reaching peak performance. You have to be perfectly equipped and need a strong partner by your side. Let us be your partner with more than 50 years of experience in industrial automation. Our open turnkey solution KeControl FlexCore suits perfectly for any kind of machinery automation. At KEBA, we are very proud of the open architecture provided by our comprehensive hardware To be successful in the market, machine builders have to be highly specialized. They often need to invest all their time and energy in further developing their domain knowledge. This may leave little or no time for automation. This is where KeControl FlexCore can help. It is an open automation system that allows users to quickly and easily create custom automation solutions. 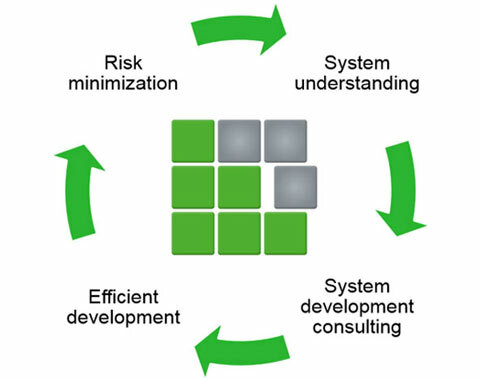 They can choose the required modules from the comprehensive KeControl system platform and integrate their own specialized software – all the way down to the core of their system. However, with KeControl FlexCore, we have now also created an unprecedented open software solution that grants you access down to the core of the system. By combining their specialized software with the innovative KEBA automation system, our customers receive a custom automation solution perfectly tailored to their target market. We also offer ready-to-use systems for HMI, injection molding, motion control and robotics. KEBA is a reliable partner in any project phase. Our experienced team has a proven international track record in automation. We support our customers throughout their projects, from project launch to setting up operations, daily operation as well as service and maintenance. KeControl FlexCore users benefit from numerous innovations. The modular software design lets them choose which KEBA modules they use and which modules they develop themselves. New modules can easily be added at a later stage. With KeControl FlexCore, customers can invest their precious time and energy to deepen their domain knowledge and build their competitive edge. 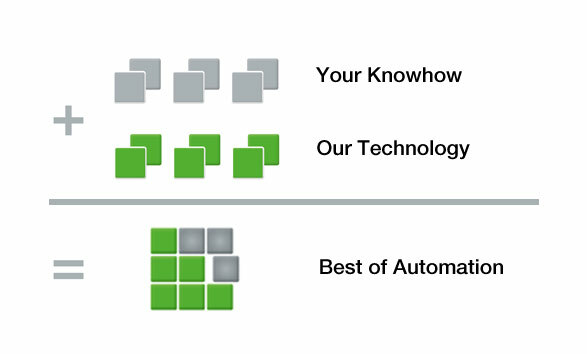 We take care of their automation needs. 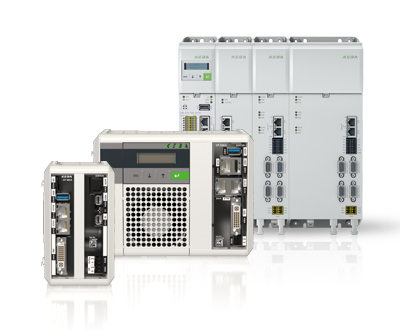 With three different architectures – Embedded, Real-Time and PLC – KeControl FlexCore is the ideal basis platform for any system. It also offers a variety of additional ready-to-use software modules. Furthermore customers can seamlessly integrate their own specialized software all the way down to the level of their operating system. This allows them to develop a customized automation solution perfectly tailored to their target market. For HMI, injection molding, motion control and robotics, we also offer plug-and-play systems. Customers can easily and quickly combine these innovative technologies with their own software. This significantly reduces their time-to-market. KeControl FlexCore offers maximum scalability in hardware and software. Customers can choose the right control system depending on their needs, all of them running on the same software platform. Once a software module has been developed, it will support any hardware performance class. KEBA is actively involved in various committees that work on standardizing Industry 4.0 technologies and protocols on the smart factory market. We know about new developments first hand and can integrate them quickly. This is why KeControl FlexCore always supports the latest standards and provides the necessary interfaces. 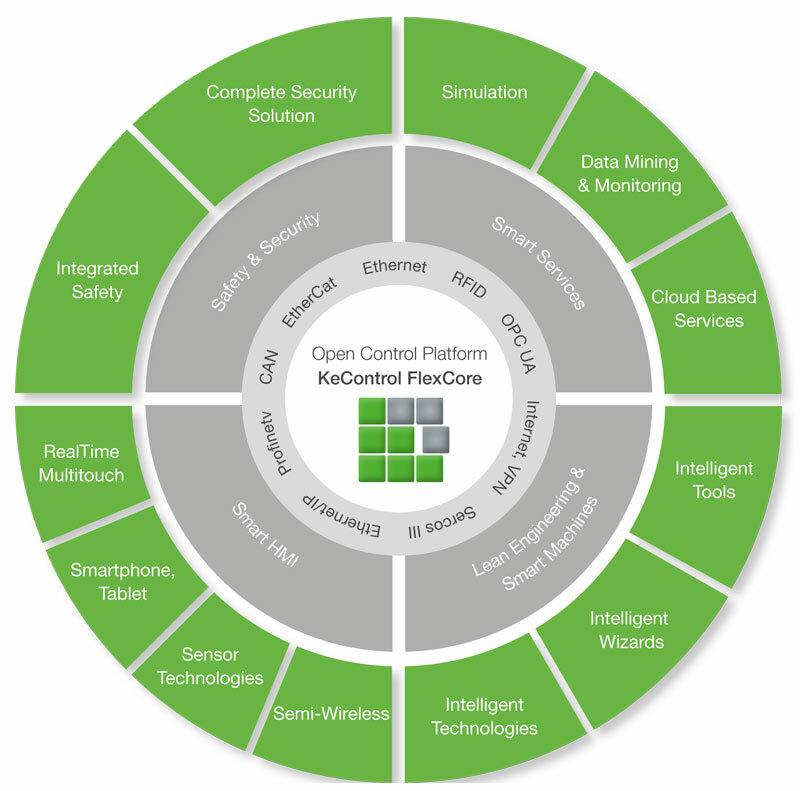 Remote service, data logging, security, virtualization, automatic optimization, best connectivity and other Industry 4.0 trends have already been incorporated in KeControl FlexCore. There is no need for additional programming or purchases. With KeControl FlexCore, users benefit from a comprehensive package of state-of-the-art technologies, as well as a short time-to-market, reduced overall costs and minimal investment risk. Maximize your strengths and minimize your weaknesses. This basic rule for product portfolio development is easy to implement with KeControl FlexCore. It optimizes the entire automation workflow. Users no longer need to take care of basic automation. They can fully concentrate on maximizing their strengths. KeControl FlexCore provides a comprehensive automation system including real-time operating system, IEC programming, open software architecture, etc. 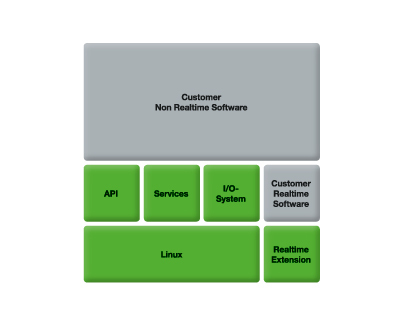 Customers can easily and quickly integrate their application-specific software and even their runtime systems. If desired, they can use both systems in parallel without the support of third parties. This guarantees full protection of their domain knowledge. Less time for automation. More time for core business. 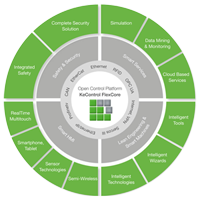 KeControl FlexCore offers a comprehensive range of remote access and extended cloud services. It guarantees system stability, availability and data security for every process step. Various plug-and-play features help customers manage their automation projects efficiently. 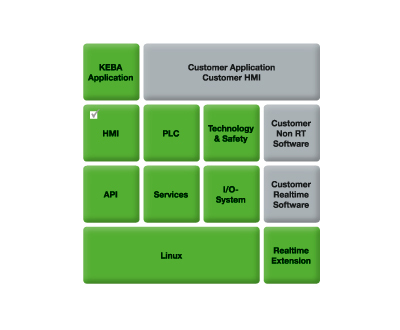 Our customers also benefit from many years of KEBA experience as a global leader in smart HMI systems. Motion control, injection molding, controls, IPCs, active and passive control panels, drives, motors, cabinet solutions, complete software solutions with easy-to-use configuration, visualization frameworks, technology packages and Industry 4.0 solutions. With our comprehensive visualization framework, high-end multi-touch visualizations can be designed in no time. At KEBA, we believe in parameterized programming. This means that users can rely on ready-to-use widgets 90% of the time. The remaining 10% can easily be designed individually in Java as the system is completely open. KEBA also offers wide-ranging UX/UI design support. Our specialists help users to efficiently create effective visualizations. With a large portfolio of available technology modules, customers can configure their system freely. Various elements such as feedback control modules, motion applications and injection molding applications can easily be integrated. 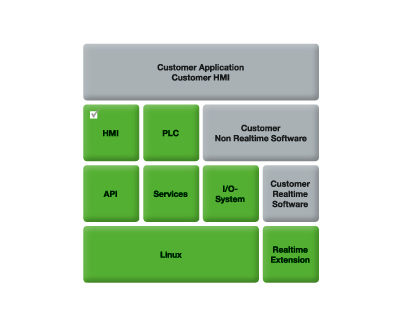 Customers can choose the basic system architecture that best meets their requirements (Embedded, RT, PLC). KeControl FlexCore facilitates easy and quick integration of domain knowledge. 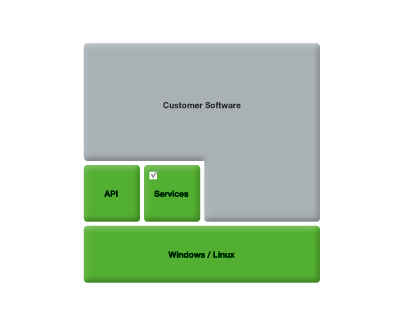 Customers can seamlessly integrate their own software modules all the way down to the core of the operating system. * Low-level APIs allow access to the entire system. * User-friendly HMI surfaces can simply be created with drag & drop and can easily be adapted to a customer’s corporate design. * The development tool suite can be individually adapted and personalized. * Our easy-to-use software supports the user with many intelligent wizards and templates. To meet various customer requirements, our hardware components are highly scalable. 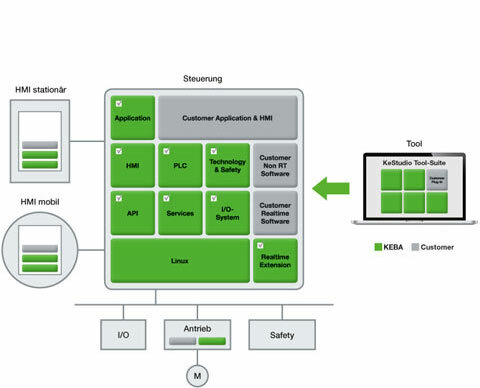 Customers can choose from different technology modules and software architectures. It is the success of our customers which also makes us successful.